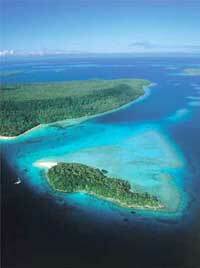 Port Maurelle is the spot where the Spaniard, Maurell the first explorer to see Vava'u, anchored his ship. It is a lovely and protected natural anchorage. From this central location you can cruise to no less than forty recognised anchorages, many of them within two hours sailing of the base. Just out of Neiafu is the lovely island of Kapa with its Swallows Cave, similar to the Blue Grotto in Capri, and a spectacular sight. To the west are the islands of Nuapapu, Hunga and Vaka'eitu. Hunga's huge lagoon, formed by the crater of an extinct volcano, can only be reached through a 200 foot wide pass. Here a traditional Tongan village shares the shoreline with the 'Island Style' Club Hunga Resort. Further along, on the western coast of Nuapapu is the fascinating Mariner's Cave, an underwater cavern which good swimmers will be able to visit. In Vaka'eitu you will find a safe overnight anchorage. Mananita is surrounded by reefs - which provide some of the best snorkelling in the area. Careful navigation through the reefs will be rewarded by the discovery of perfect white, powdery beaches. A stroll inland will take you into a luxuriant natural temple filled with the brilliant green light provided by the large-leafed puko trees. Kenutu is an idyllic lagoon for an overnight anchorage, with an attractive beach, excellent diving for experienced divers on the reef and a walk on the ocean side to visit the caverns and blowholes. While you are here, the Berlin Bar is a great stopover. Throughout the cruising area, you will find amazing diving and snorkelling, in crystal clear waters, with brilliantly coloured coral and reef fish. A delightful small island surrounded by a sandy beach, Mounu is the South Pacific island of your dreams. A new mini resort has been established on the western end of the island, call ahead on the VHF and make your reservation for a gourmet meal. Mounu makes a perfect add on to your sailing holiday, why not book in for a day or two after your charter. A tiny island with a cosy anchorage alongside an idylic sandspit, Nuku is possibly the most photographed island in the Kingdom of Tonga. A perfect day stop for safe swimming and snorkelling for those beginners to gain their confidence. Nuku becomes a favourite with all who visit Vava'u. Adjacent to Nuku and Port Maurelle, Ava provides some amazing snorkelling and diving, particularly along the western shoreline. The mid afternoon sun highlights the natural colours of the coral and fishlife, the depth dropping away to around 200 feet. Orientation, chart briefing and checkout of your yacht. Sail to Port Maurelle on Kapa Island. Snorkel the north side of Ava Island. Sail to Nuku and anchor off Fale Vai. Sail out the Faihava Pass to Hunga, where the fishing is excellent (with your own gear). Anchor in Hunga Lagoon. Enjoy a short sail to Foeata for snorkelling. Sail to Vakaíeitu for the night. Sail south for a day trip to Luaa Fuleheu or Luahaipu, both beautiful and uninhabited. Sail back to Vakaíeitu and snorkel the reef. Beach Sail to Euaiki and then on to Hinakawea Beach for a Polynesian feast and traiditional Tongan dance. Sail to remote Maninita for lunch and snorkelling. After lunch, head north to Kenutu and anchor overnight. Leave early for Fanua Tapu Pass. Anchor on the north side of Taunga and snorkel the reefs of Tauta. Sail carefully through the reefs to visit Mafana and Olo'ua. Sail around Taunga for snorkelling between Ngau and Pau. Sail for Nuapapa and Mariners Cave, then on to Swallows Cave on Kapa. Return to Port of Refuge Harbour to check in with Moorings before noon.